The HPE Procurve 3500 and 3500 yl switch series is a group of advanced intelligent-edge switches available with 24-port or 48-port fixed ports. 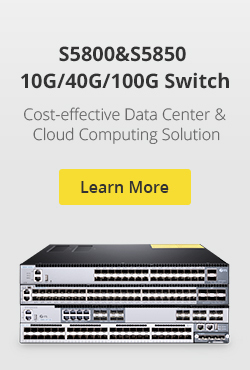 These switches are with a variety of Gigabit Ethernet and 10/100Mbps interfaces. Both 24-port and 48-port switches have POE+, POE and non-POE options. Moreover, Gigabit Ethernet switches are with optional 10GbE module slot. HPE Procurve 3500yl-48G POE switch is one popular model of the 3500 yl switch series. This post will focus on this switch model and introduce compatible transceivers and cables that can be used in it. HPE Procurve 3500yl-48G 48 port POE switch has 44 autosensing 10/100/1000BASE-T ports and 4 dual-personality ports. Each of these four ports can be either an RJ45 10/100/1000 port with POE or an open mini-GBIC slot. It can be used as an advanced access layer switch or small distribution layer switch. With 44 fixed RJ45 10/100/1000BASE-T POE ports, it can support a considerable number of end application. And with an open module slot that supports a maximum of four 10GbE ports, it is flexible and promising when there’s need to upgrade to higher data rate or longer transmission distance. Figure 1: 48-port HPE procurve 3500yl-48G POE switch. It should be noted that each of the four mini-GBIC slots is shared with the associated 10/100/1000Base-T RJ45 port. If a mini-GBIC is installed in a slot, the associated RJ45 port is disabled. Figure 2: 4 dual-personality ports of HPE procurve 3500yl-48G POE switch. 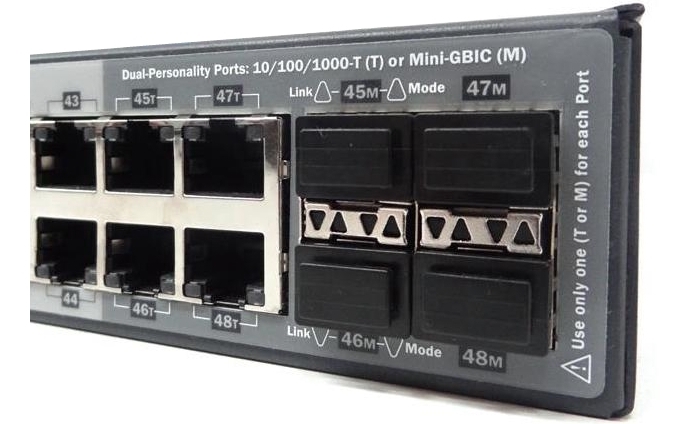 The HPE 3500yl-48G POE switch is a multi-rate device that can support various types of network cable; when using the 4 mini-GBIC ports, different optical transceivers and cables can be used in them. For the 44 autosensing RJ45 ports, they can be used for 10/100BASE-T connectivity in half or full duplex mode, or for 1000BASE-T connectivity in full duplex mode. Ethernet cable like Cat5 can achieve the 10/100/1000BASE-T link. 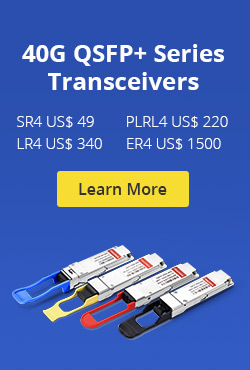 In terms of the mini-GBIC port, since there are three optional choices (X2, CX4 and SFP+) for the open module slot, 10G transceivers including X2, CX4 and SFP+ are possibly to be used. The following table explains what network optics and cable can be used. By the way, J8177B Gigabit 1000BASE-T mini-GBIC is not supported on the 3500 switch series. Table: HPE compatible optical transceivers and cables. The above mentioned compatible optical transceivers and network cables can work well in HPE Procurve 3500yl-48G POE network switch as the original models do, but are much more affordable. These compatible modules are tested in the switch and are ensured to work on it. If you know other working devices in this switch model, welcome to share with me and my readers. This entry was posted in Switch & Transceiver and tagged HPE J9153A compatible, HPE Procurve 3500yl-48G, J8693A on September 29, 2017 by Serenity Huang.